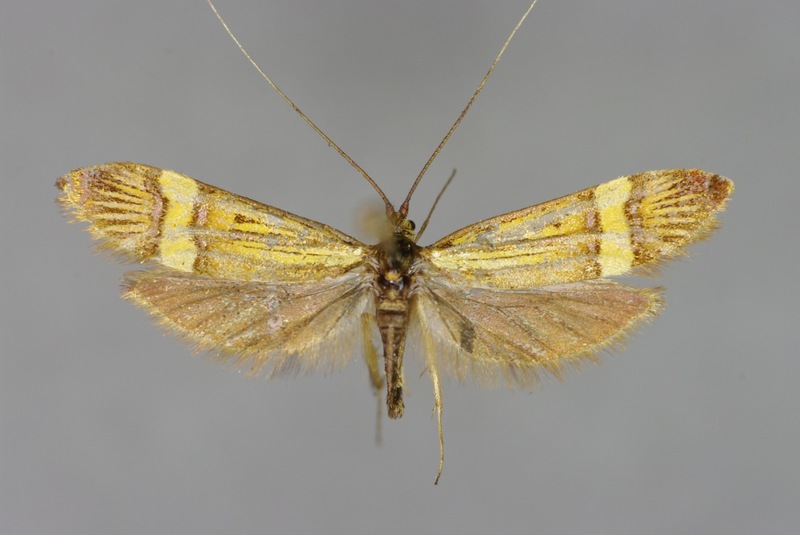 Phalaena (Tinea) degeerella Linnaeus, 1758: 540, no. 286 (justified emendation of De Geerella; ICZN, 1999, Art. 33.2.2). Description of adults: Examined: 20 , 12 . 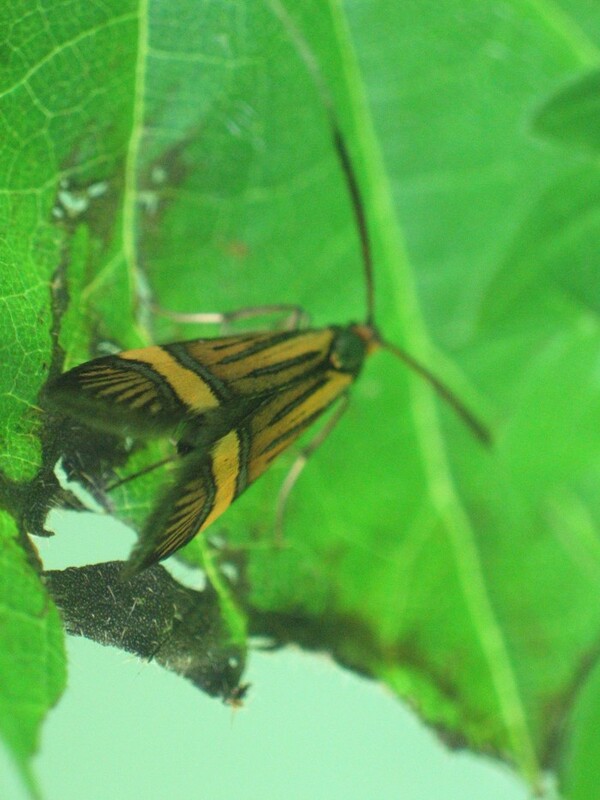 Forewing length: 8.5 - 9.75 mm, 7.0 - 8.3 mm. Head black-brown; vestiture of hair-like scales on the head black between antennae, yellow at neck and collare; face smoothly scaled, brownish coppery shining; eyes about 0.35 mm ( ), respectively, 0.25 mm ( ) in diameter, oval, black; distance of eyes (frontally) about twice the diameter of an eye; scapus of antennae strongly inflated, flagellum basally with backwardly directed spines in ; antennae of about 2 1/2 - 3 times of forewing length, dark brown with coppery glance proximally, silvery white distally of 1/2 of forewing length; antennae of 1 1/2 - 1 2/3 of forewing length, dark brown, purple shining, basally with a dense beard of distant scales; distally smoothly scaled, silvery-white; labial palpi very short, 0.3 - 0.4 mm long, diverging, smoothly yellowish scaled, with few distant, long black setae and pointed distal segment; thorax and tegulae bronzy golden shining; forewings with a slightly irregular fascia across the whole wing width at 2/3, the fascia consisting of three parts; the central part broad, yellow, the lateral parts only half the width, delicately bordered black, violet with a lead-like glance; the basal part of the wing with similar, delicately black bordered, violet, longitudinal stripes with leadlike glance at costa, cubitalis and analis 1, the costal stripe only reaching the cross-fascia; the aerea between these stripes yellow proximally, leather-like brown distally, with a delictae, partly branching, longitudinal black line each between costa and cubitalis, as well as between cubitalis and analis 1; inner margin indistinctly bordered, greyish with lead-like glance; distal part of the wing dark brown, bronzy golden shining, with yellowish-brown, longitudinal stripes along the veins, which are often confluent at the central cross-fascia, but do not reach by far the outer margin; fringe dark brown with purple to bronzy golden glance; hindwings with broad scales, completely covering the wing membrane, brownish-grey, with intensive violet schimmer; outer margin with an indistinct, delicate, bronzy golden line, anterior margin of hindwings broad whitish; fringe grey-brown, bronzy golden shining; underside of all wings dark brown, especially along the margings bronzy golden shining; yellow markings of upperside only indistinctly visible; costal margin of hindwings delicately yellow; legs brown, partly bronzy golden shining; foretibia with long epiphysis; midtibia with a long pair of spurs at the distal end; hindtibia inflated, yellowish, with a pair of spurs each at about 0.6 of the tibial length and at the distal end, as well as with scarse, long, hair-like scales; abdomen dark brown, weakly bronzy golden shining, sternites yellow at the distal margin. In Europe, the species-complex has been recorded form from most countries. It is absent only from Iceland and the large Mediterranean islands, whereas in Slovenia, the southern Balcans and Moldova it has not yet been found (Karsholt & Nieukerken, 2010). Vertical records have been documented from near sea-level to about 1300 m a.s.l. (Kurz & Kurz 2010). Members of the species inhabit structured edges and outskirts of wooodland, clear-cuttings rich in tall-herb vegetation and bushes, but the animals also fly inside woods, provided that the vegetation is not too dense. The imagines are day-active, flying from mid May to the end of July (Kurz & Kurz 2010). 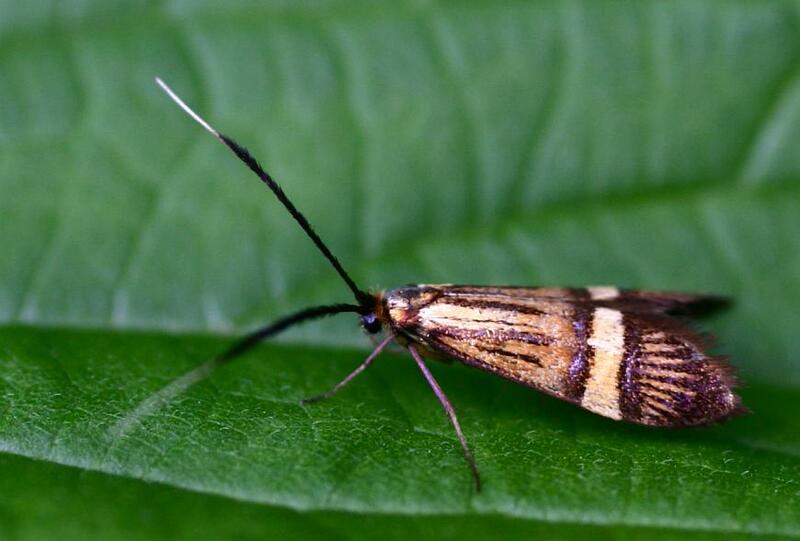 Nemophora congruella Zeller, 1839 is very similar to N. degeerella s.l., but slightly smaller, the light forewing markings being bright yellow instead of partly leather-brown. 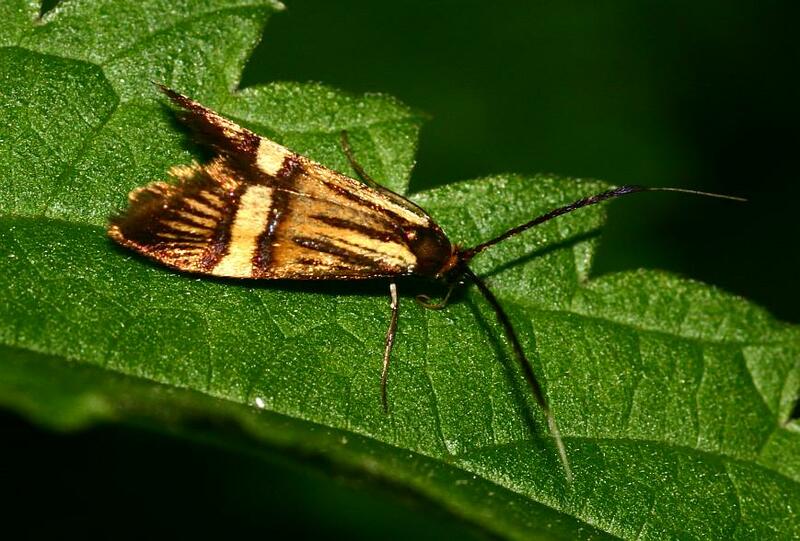 Of the three violet longitudinal stripes with lead-like glance in the basal part of the wing, also the central one reaches the cross-fascia. The cross-fascia is more straight and less irregular than in N. degeerella s.l.. 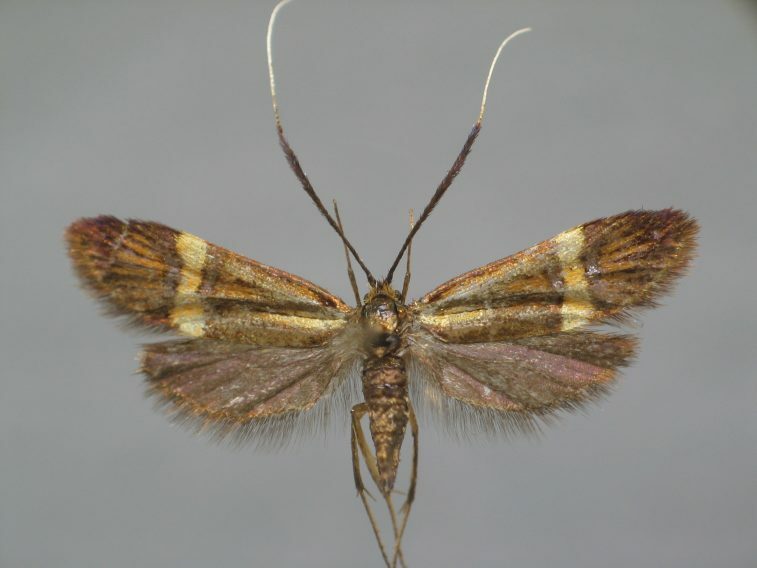 The beard-like, distant scales in the proximal part of the antennae are missing in N. congruella. 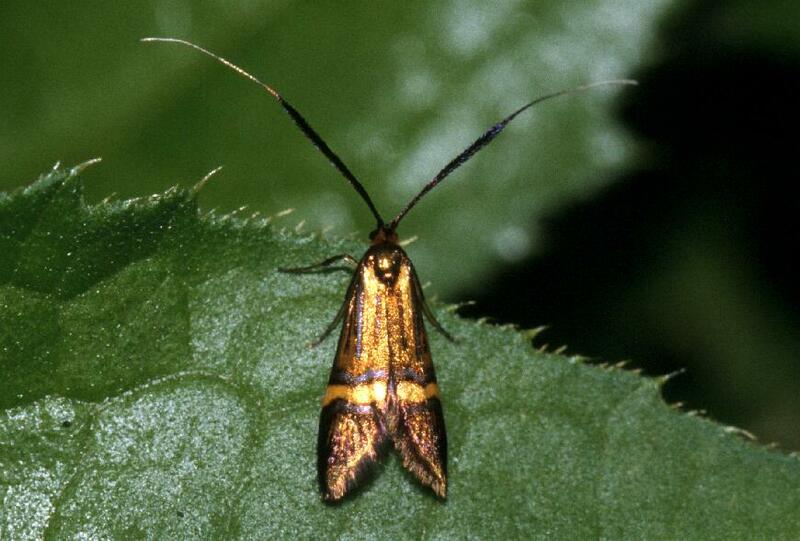 Furthermore, very similar externally are Nemophora amatella (Staudinger, 1892) and Nemophora bellela (Walker, 1863), but both species are distributed almost allopatrically to N. degeerella s.l. in the northernmost parts of Eurasia only (N. bellela in North Amercia also). 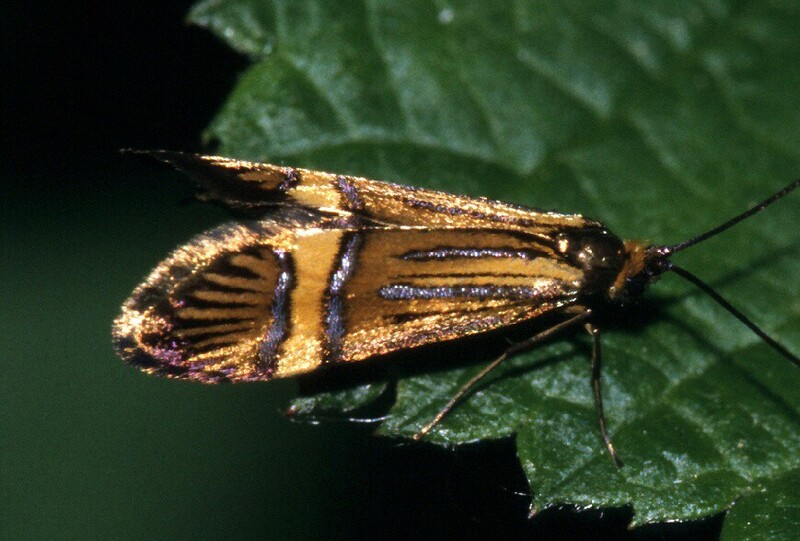 N. degeerella s.l. differs from N. amatella externally by the broader forewings (Kozlov 2004) and by slight differences in the shape of the medial fascia: The lateral violet lead-like segments of the fascia are only one third in width compared to the central yellow segment in N. amatella, whereas in N. degeerella s.l. they are about half as narrow only. Furthermore, the fascia is located slightly more apically in N. amatella. In N. bellela, the lateral segments are nearly as broad as the central yellow segment and the fascia is distinctly constricted in the anertior half. All other light wing markings are not yellow, but brown. 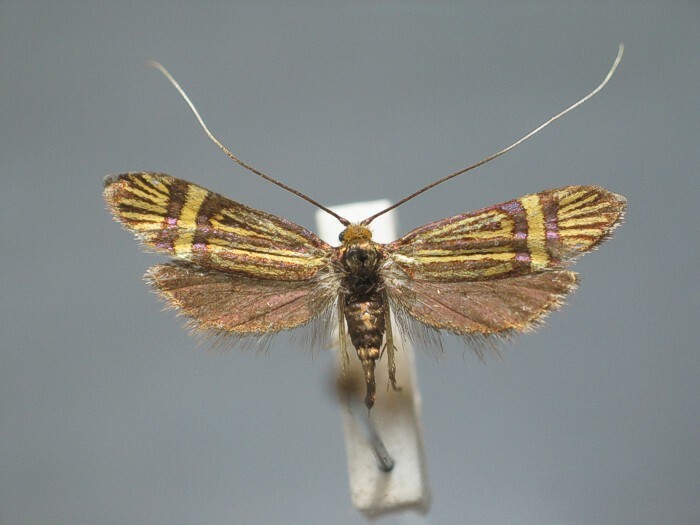 Males of N. bellela can be recognized best by the short antennae compared with the two other species, being only twice as long as the forewing length (Kozlov 2004). 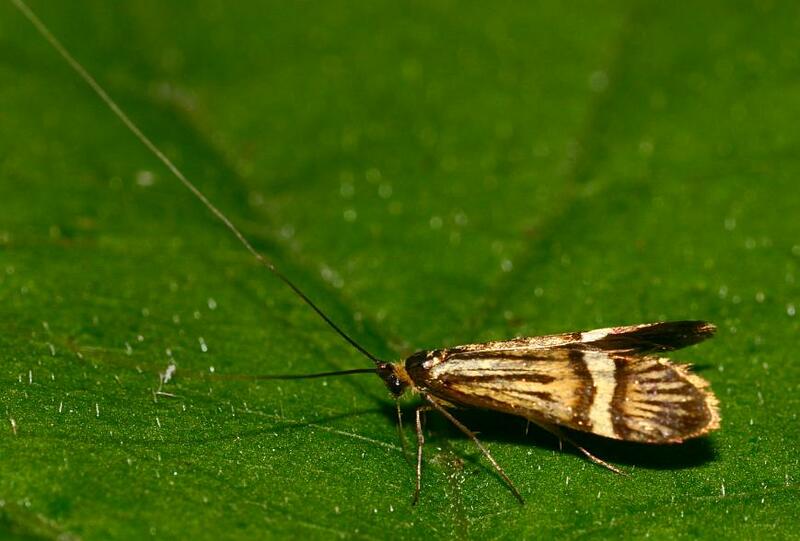 Also quite similar in general appearance to N. degeerella s.l. is Adela croesella (Scopoli, 1763). 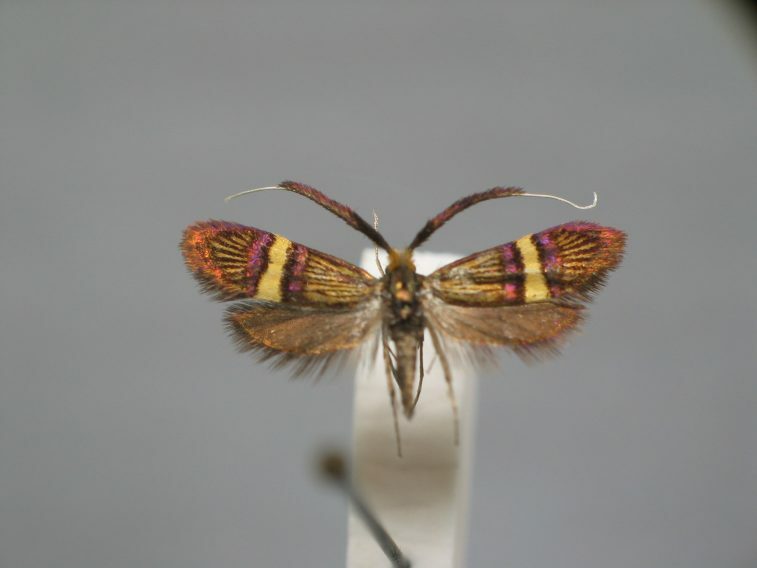 The latter is distinctly smaller, with better contrasting, purple-violet markings in the outer part of the wing. The purple-violet, lateral segments of the three-segmented medial fascia are equal in width to the central yellow one in A. croesella, whereas in N. degeerella s.l. they are only half as broad. Karsholt, O. & E. J. van Nieukerken 2010. Adelidae. In - Karsholt, O. & E. J. van Nieukerken (eds.). 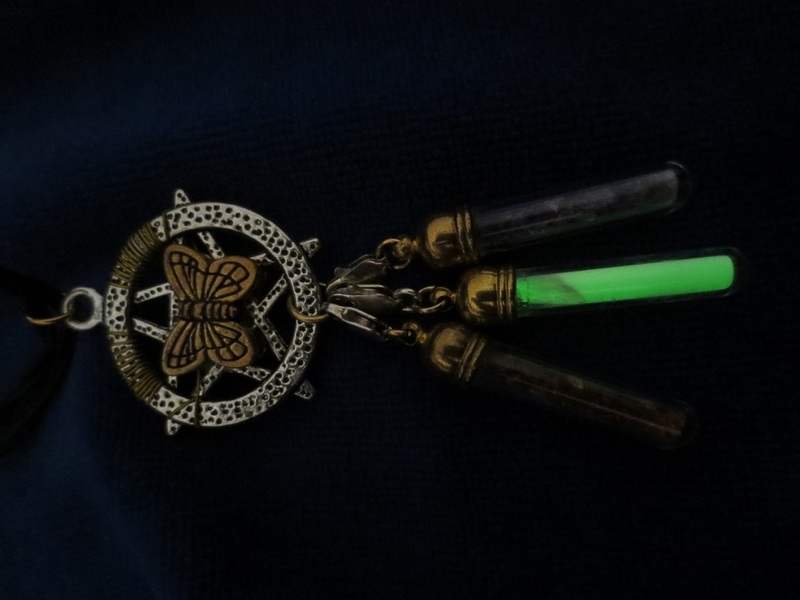 Lepidoptera, Moths. � Fauna Europaea version 2.2., http://www.faunaeur.org [online 27 September 2010]. Kozlov, M. V. 2004. 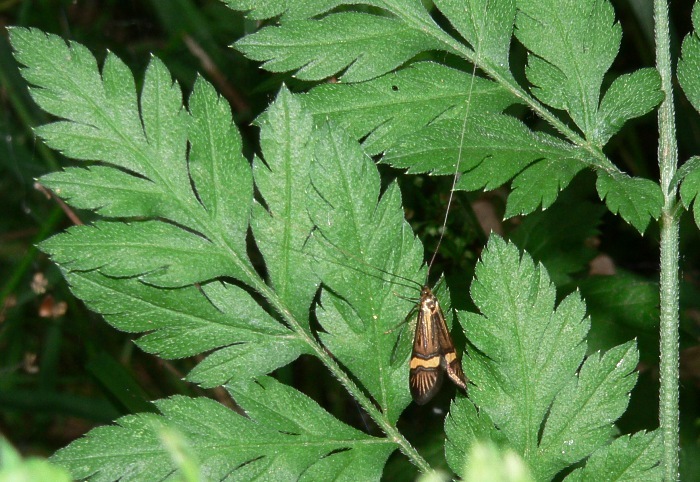 Annotated checklist of the European species of Nemophora (Adelidae). Nota Lepidopterologica 26: 115-126. K�ppers, P. V. 1980. 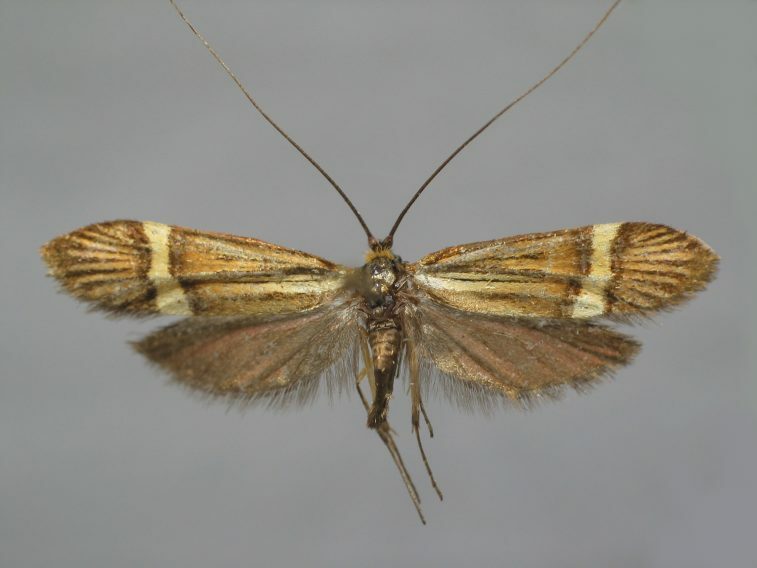 Untersuchungen zur Taxonomie und Phylogenie der Westpal�arktischen Adelinae (Lepidoptera: Adelidae), Dissertation, Wissenschaftliche Beitr�ge Karlsruhe, Verlag M.Wahl, Karlsruhe. Kurz, M. A. & M. E. Kurz 2000�2010. Naturkundliches Informationssystem. � URL: http://www.nkis.info [online 21 June 2010].